Environmental Activities | AMCON is the solution for sludge dewatering press and treatment. 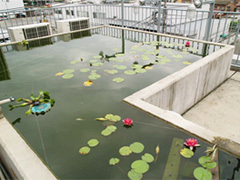 On top of our company building, we have a pond and a garden filled with green. 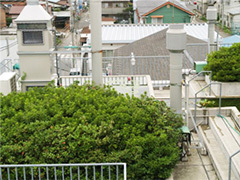 A green roof curbs a temperature rise of the building as soil’s thermal insulation and plants block sunlight and reduce the load on the air-conditioners. A pond has a similar effect. Water protects the building against heat while evaporation of water takes heat and cools the area. 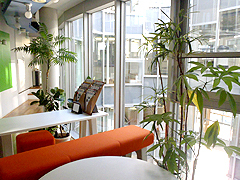 "Creating a comfortable working environment with air-conditioning setting of 28°C!" We hope to help reduce CO2 emissions ascribed to the global warming by greening the building and reducing the load of air-conditioners. We are carrying out a cleanup activity of our community. Let’s clean the streets is our watchword. 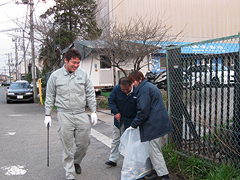 When we ask people from other countries their impression of Japan, they often say it is the cleanliness of the streets. It is nice to hear a good thing about our own country. 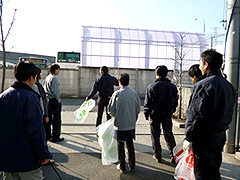 We wish to be of some help to the community where we work in keeping the streets clean. This is an idea that has led to our activity. We walk around picking up litter. 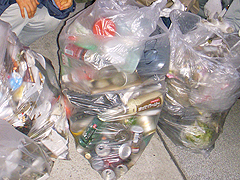 We usually collect some twenty bags of litter in an hour. While we are collecting litter, neighbors sometimes talk to us. That is very encouraging. One day, an elderly person said, “since we have young people like you, the future of our planet will be bright.” That made us really happy. We will continue this cleaning activity for the community. This is something we can do. Some component units of our products need periodic replacement. We are recycling some of those units. After we receive a used unit from a customer, we carefully disassemble the unit and clean the parts. We select the parts that meet our quality standards. We reassemble those parts into a unit, turning them into new products. One of our employees said “These parts are still usable. It is waste to throw them away.” That started this activity. Repeatedly reusing parts reduces impact on the environment and make it possible to offer products at competitive prices.